SOEKS is proud to offer industry-leading Geiger counters, radiation detectors, dosimeters, nitrate testers, EMF meters that help people in their daily lives. We stand behind the quality of our products. And what is a better proof than the kind words of our loyal and satisfied customers? "I love the excellent service! I recommend this site to EVERYONE I t as l with. Q "
"I found the batteries that came with it where not viable. Replace them with new ones and it worked. Always carry an extra set of batteries if you plan on using it a lot, they will drain of left on for more than 10 hours." I think it’s a wonderful product.a few things to improve. "It looks a bit fragile. And the water tester seems a bit too sharp. Sometimes the towel get attached to it. But it is a wonderful device. Screen looks cheap. But it better lasts 8 years as it says because if not I’m asking for a refund! Very nice device. Also it indeed is expensive. Is the Geiger sensor that expensive or just because they’re the only ones making these devices? But still, once again. WONDERFUL PRODUCT"
"Excellent highly recommended easy to use product "
"Using this to monitor an incoming materials area for radioactivity. Working as expected. Happy with purchase." "I found some radiation on the yard. Still getting the hang of how to search with it. It seems to work fine for scrap metal. I will be updating this next few trips to the mill or sooner if we get tagged with another hot load. Customer service is exceptional while I wish they would have sent the full english manual." "Outstanding product with fast shipping, a great Company." "It works. I have looked it over and see that EMF, radiation and water tests are okay. I will see how other things work as time goes on." "Una muy buena opción para poder medir o saber sobre posibles factores que pueden dañar la salud. Me gustó mucho la función de analizar la calidad de agua y el medidor de radioactividad. " "The product seems well made and is easy to use. Have found it interesting testing for nitrates and radioactivity . I do wish It had a setting for testing coffee and wish it was able to test any food product. " "Super cool to check out things and see what is unseen an unfelt "
"Love it. I was worried that this would be a gadget that I would play with for a few days and then end up in a drawer. But, I use it all the time. All four functions are super accurate and really well calibrated. It's easy to use and there's no complicated setup or calibration process. The water tester lets me know when to change filters and when not to use a water source. The EMF sensor has helped me position home electronics in safer locations. The nitrate tester generally confirms what the health food stores have been telling us. And the Geiger allowed me to test my watch collection and antique collection, as a result I now store some items in a safer location due to radium and uranium content. It also allows me to test antiques before I buy (yes antiques can be radioactive). Great item! Haven't had a chance to take it on the road, but this will be great for travel safety too. I can't wait for a work trip to Florida to test how bad the stinky tap water there really is. Highly recommended!" "I like it much better than my old one." 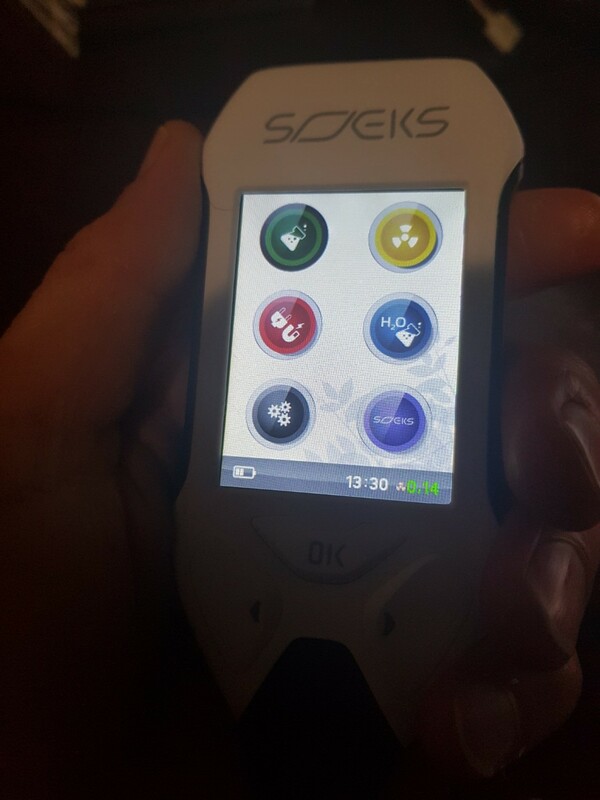 "I received my Soeks EcoVisor F4 Friday January 11, Saturday I tried it out first time testing my water in home ,tap water ,filtered water and purified water bought from local store , I was very impressed with how user friendly it was to operate first time and my “different “readings from each water sample I checked . I’m looking forward to using all my functions in soon time . Thank you Soeks ! Dave in Indiana "
"Easy and intuitive to use. I started using it before reading directions. I have started tracking water wand food feom different parts of the USA. Only downside, I wish the battery life was longer.. Device is good for a high-level, quick testing for safe food, water, enf and radiation." "Stan I received the unit in about 3 days. It gives me peace of mind to keep on top of our changing world. I am a retired electrician. I wish I would have had the unit while I was in the field. The equipment and environment was always new and nobody knew back then about the dangers we were around. The unit is very easy to operate. Thanks you John Hill"
I will use every function! "My favorite function is &quot;all of them&quot;, although I would probably use the EMF function the most frequently. The addition of the dosimeter is a deal breaker! I will use every function because this device makes it so easy to learn how to use it. Because everything is contained in one device, I am also more likely to carry it with me and have the function I need at any time. I was also pleasantly surprised to learn that SOEKS will provide a software upgrade in the future to be able to download data to PC. The designers of this product did a wonderful job! KUDOS to them." "It is so simple and easy to use, I just love it." "Just received my Ecovisor F2. It has tested many foods I have. Many are about what I expected, but some foods are testing &quot;clean&quot; for nitrates. I have been hospitalized 3 times with nitrate poisoning, so this little tester will be literally a life saver! All my Doctors are excited to see it in action too. Thanks! Brian"
"I just received it last week end, and didn't have much time to experiment as much as I wish. 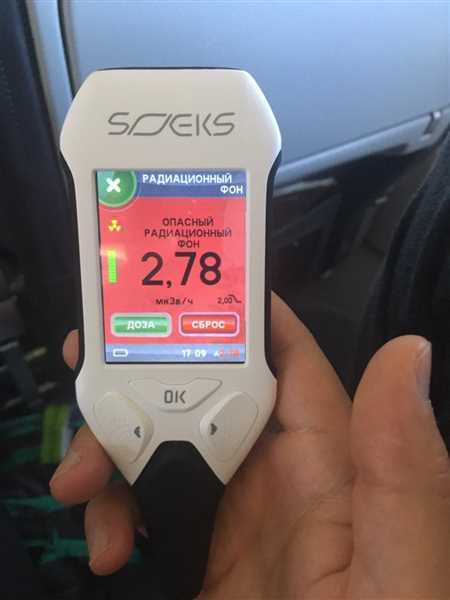 I wanted a Geiger counter and SOEKS advised me to get the complete model, and even offered me a nice discount (which helped me pay the customs duty). So, overall I am overjoyed with this little gizmo. A big THANK YOU to SOEKS for everything !" "Always check the food when you cook for your babies! Nitrates are dangerous!!!" "Radiation detector is sensitive and accurate as you would expect from the Russian made SBM-20-1 Geiger Muller tube. The dosimeter function is also a nice bonus. I was really impressed however by the quality and technology of the Nitrate Tester probe. It really helped me and my wife to keep track of the nitrates in our diet. I even got another one for my parents as well. You'd be surprised what you can find in your local fish store or farmers market." "No problems. Great experience with purchase/delivery and usage of the tester. I'm checking all the products for my granddaughter." "I have used this to check my everyday purchase of fruits and veggies.already found peaches,not local that were very high in nitrates,cost 1 peach.lol.also checked my bottled water,I am very satisfied and would recommend that anyone concerned about heath and source of there food to have this.with all the suppressed news on radiation reaching our west coast I would want this.thanks..mike"
"My overall experience was very good. Do you have more information, a manual, for operation?" Great Geiger counter. Fulfillment on standard shipping is slow. "Worked fine easy to use delivery as promised thank you"
"Our health will greatly benefit from using the EcoVisor 5-in-1. For instance, we were appalled to find the high level of nitrates in farmed salmon: ~1300 mg (per kg of product). It looks as if they have done it on purpose. The tester is also useful for testing high electromagnetic fields like the ones emitted by electronic devices or wiring, which are also often unconstitutionally used against people. " "Fantastic easy to use device. Gives you accurate readings and a good battery life.. highly recommend for anyone. So simple to use."